Meet Samuel Cox, a creative technologist based in London and founder of the self updating price tag. 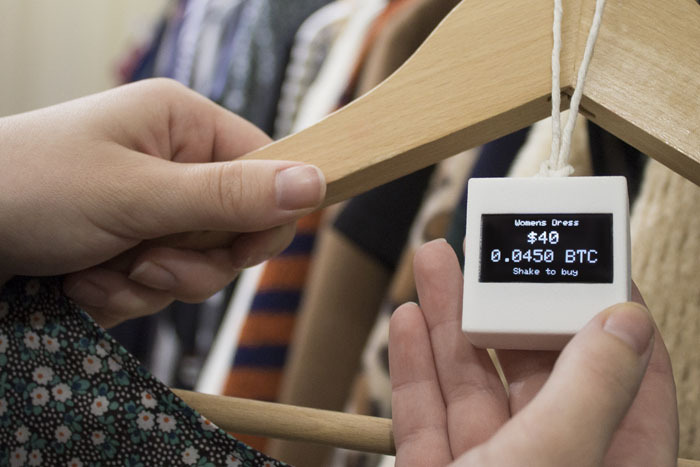 BitTag is on a mission to streamline the gap between retailers and customers by providing real time price conversion with a simple shake, cool eh! 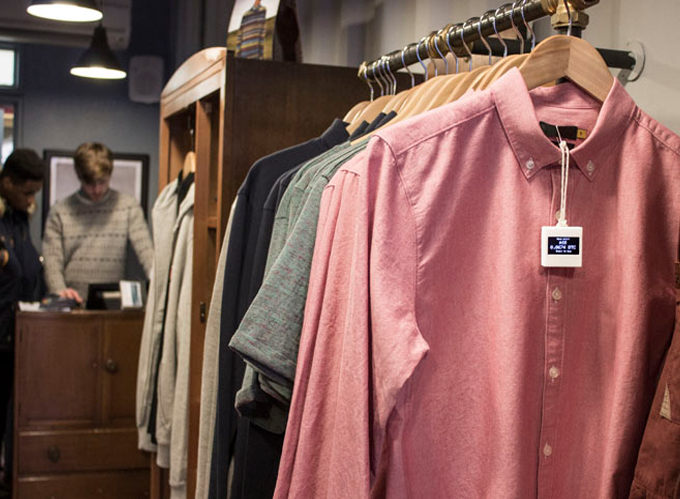 BitTag is currently in the prototype stages of development but were showcased at the BoxPark shopping centre in Shoreditch. The device is priced at around £40.00(TBC) but seems to be aimed at quirky high end retailers and not your mass market shops. Think Liberty of London and Harrods etc. The devices are permanently connected to a computer running the BitTag app using Bluetooth low energy technology. 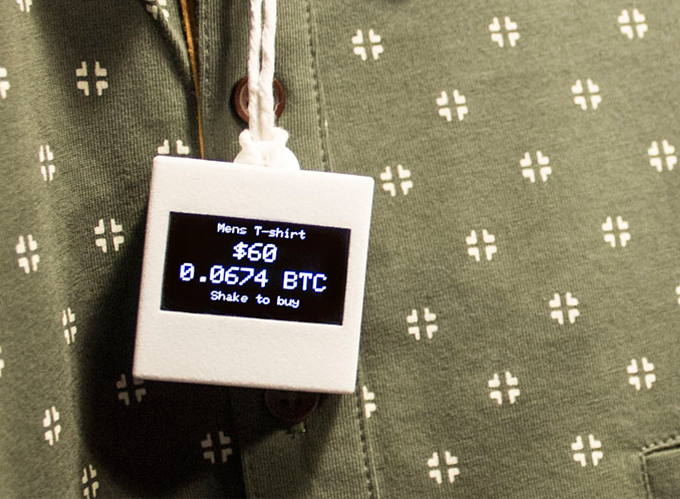 The tag automatically synchronizes the current Bitcoin price based on the set currency. If the connection is lost, the price freezeS to the value before connection loss. BitTag also uses little processing power with its OLED display and a rechargeable LiPo battery. Customers can simply shake the device to activate a QR code which can be scanned using the customers smartphone Bitcoin wallet, it couldn’t be any simpler. We quickly interviewed Samuel, covering a few security issues that popped to mind and to find out when the device will hit the shops. How safe is the tag in terms of security issues? The tags don’t process the transactions. Bitcoin Wallets like Blockchain still handle that. So they payment side is external. Because it updates the price wirelessly, there’s a chance someone could possibly change the value. But we’re aware of that and are designing to prevent that. End of the day, no system is ever 100% safe. What if the WIFI goes down? If Wifi goes down, then it’ll just display the latest result before the wifi dropped. Again, because the users pay via their phones and are usually on 3G, it shouldn’t effect the transaction. How do you intend to get popular retailers on board using BitTag? have you got any lined up to trial? At the minute we’re exploring options with retails. Very much one step at a time. What were you doing before BitTag? Are you from the fashion/clothing industry? I’m a creative technologist, which means that i’m always designing objects and experiences that fit in-between the digital/physical with technology. So not from the fashion industry at all. Important to note that BitTag can work in other mediums outside of fashion. No funding yet – all my own money and time. Looking for raise now. What is the cost per tag? Pricing is still TBC as it’s currently a prototype. As low as possible. You are based in London, how is the Bitcoin scene? Bitcoin scene is bubbling up nicely here. We’ve got a few Bitcoin ATMs being installed soon, even a pop-up burger joint accepting it. There’s still some way to get it mainstream though. When is the launch? when can retailers/merchants buy the tags? Launch is still somewhat of an unknown entirety. Because Bitcoin evolves so rapidly, you almost have to make and run… hopefully in the right direction!